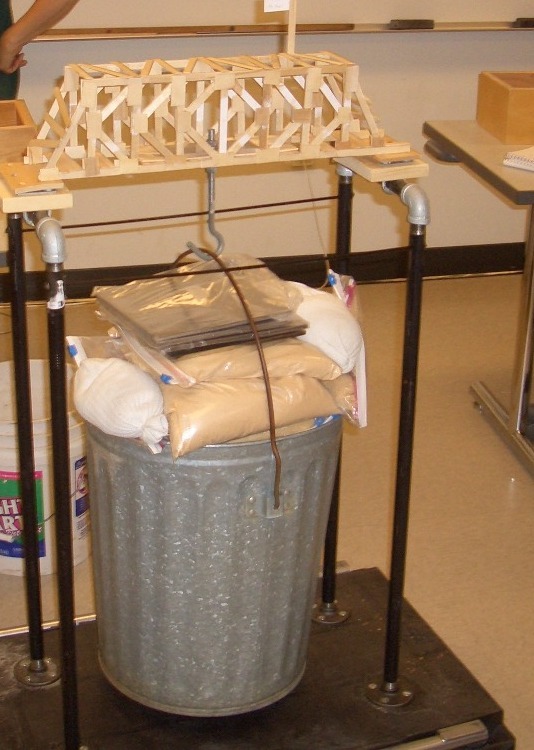 This bridge is supporting 191 lbs of weight. It didn’t break, that was all the weight we could fit in the trash can. I believe this is close to the maximum load it could hold because the platform the jig is resting on was significantly bowed. The rest of the structure was rock solid. The construction of the bridge is popsicle sticks. wow…dats really :o…it gave me idea for my popsicle sticks bridge project..^^.. I built a k-truss out of popsicle sticks for a contest and it held 716 newtons!